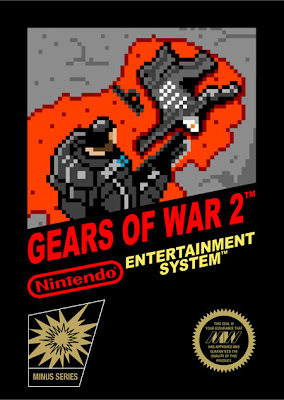 There's a large gallery of modern video games with classic NES-style cover art here. 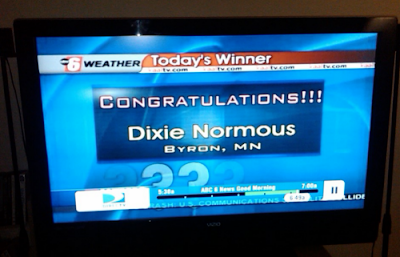 A roundup of fake names that made it on TV. 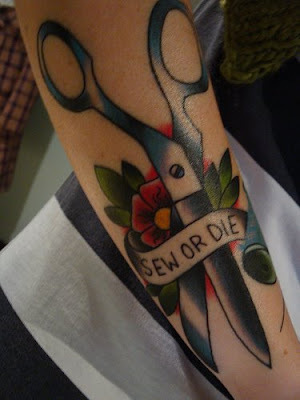 There's a sewing-themed tattoo Flickr group. Sew or Die belongs to Katy. 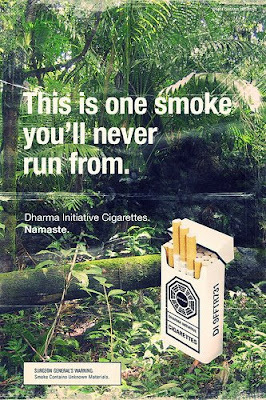 An entire gallery of vintage Dharma Initiative advertising. 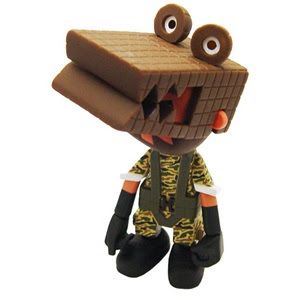 You can now buy the Michael Lau Solid Snake with Crocodile Cap toy ("Gardener Square Snake"). 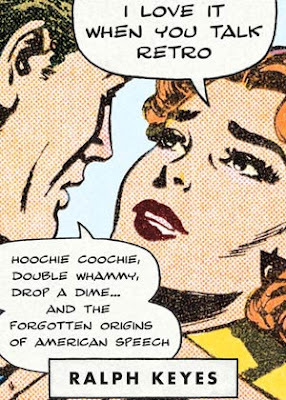 I Love It When You Talk Retro: Hoochie Coochie, Double Whammy, Drop a Dime, and the Forgotten Origins of American Speech by Ralph Keyes. 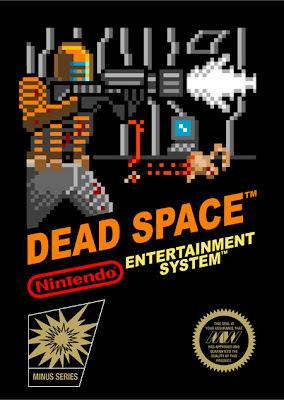 You can read an interview with Keyes here. 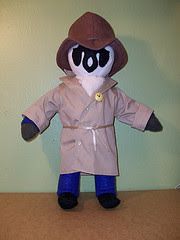 I was surprised to find out that there were no "secret decoder rings." 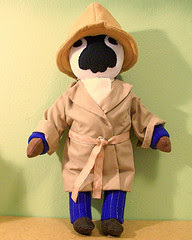 There were secret decoder pins, but no rings. Sir Harold Gillies, sculptor Kathleen Scott, artist Francis Derwent Wood and others worked together during World War to create masks for British troops disfigured during World War I. 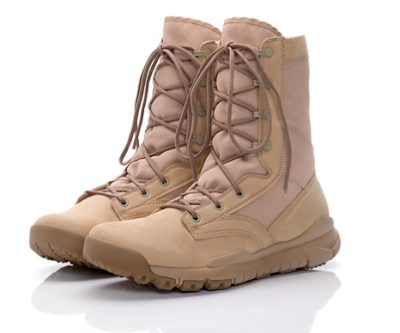 The official name for the facility was "Masks for Facial Disfigurement Department." 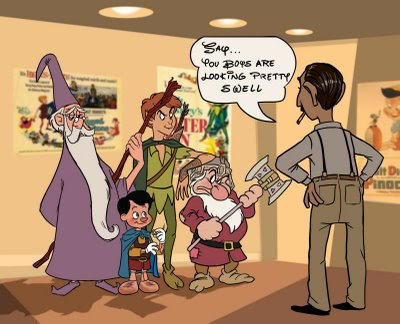 But the troops called it "The Tin Noses Shop." 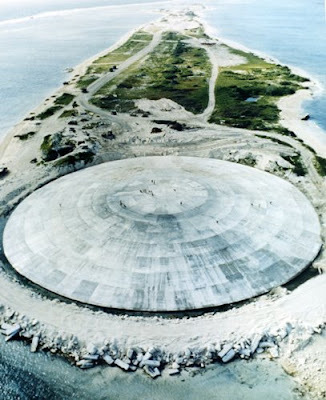 "Nuclear testing by the US totaling more than 30 megatons of TNT took place during the cold war; in 1977–1980, a concrete dome (the Runit Dome) was built on Runit Island to deposit radioactive soil and debris"
Deep Sea Dresser by Alicia Cornwell and Tony Bevilacqua of Chroma Lab on sale at Etsy. 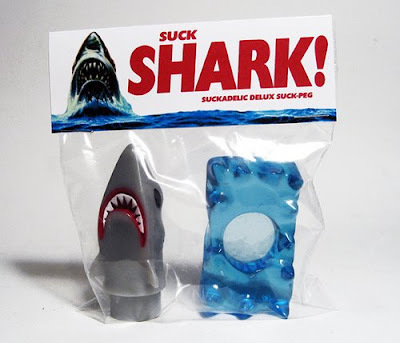 New toys unveiled by Sucklord. Kitty Pryde by Ana Galvan. It's part of a Kitty Pryde-themed show organized by Oni Press and Floating World Comics to raise money to research hemophilia. Here's another Kitty Pryde by Bryan Lee O'Malley. 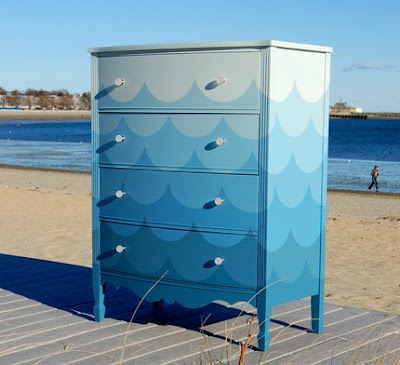 And here's one by Zachary Baldus. 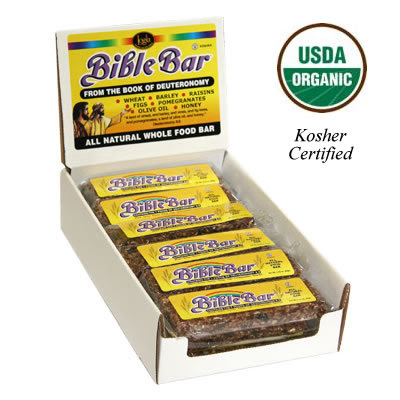 The Bible Bar by Logia Foods is a kosher food bar made from the seven species of foods that God calls "good" in the Book of Deuteronomy (wheat, barley, vines (raisins), figs, pomegranates, olive oil, and honey). 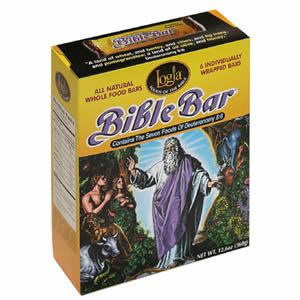 Also available: "Bible Bread." 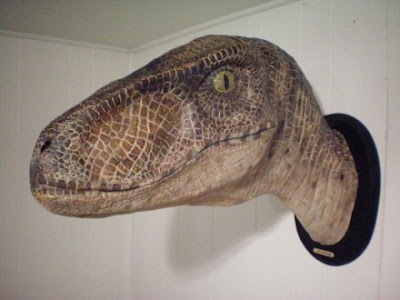 Mounted Velociraptor head on sale at eBay. Maryland's women's college basketball team has the motto "Eat Kids"
For example, if they're doing well, at halftime, one player will say, "We're halfway through the kids' body now, keep going." Or if the first half didn't go particularly well, "you already had the head, you already had the hair." 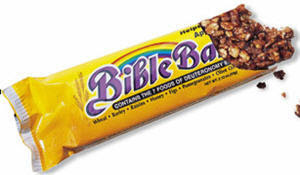 It's an homage to Mike Tyson's famous line. 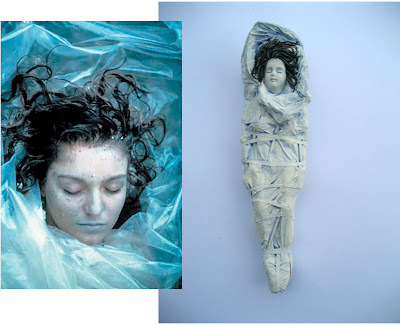 Porcelain Laura Palmer in The Black Lodge by Kiersten Essenpreis. Desktop wallpaper sized version here. 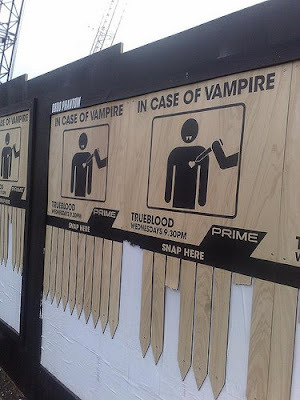 Clever ad for vampire series True Blood features breakaway stakes. More photos here. 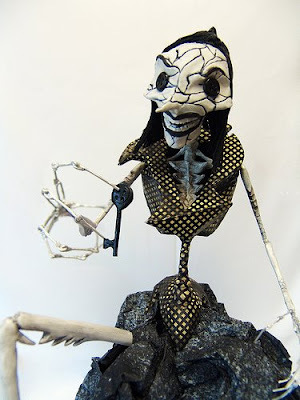 OctoMom sculpture by Daniel Edwards available here for $200. 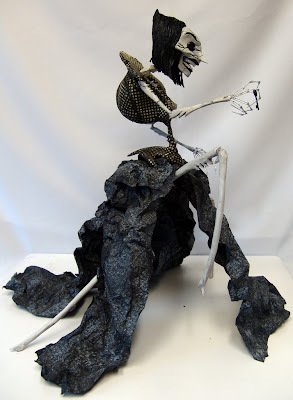 You can see more of his sculptures here. 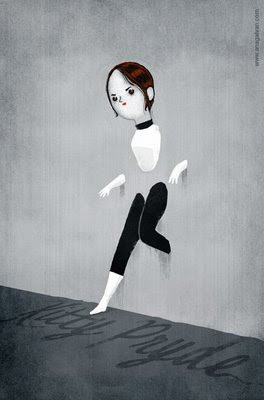 By kittyzilla. 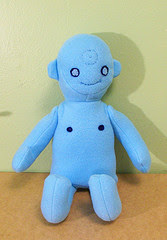 Check out the plush Doop from X-Statix she also recently posted. And here's her Etsy shop. My Little Mochi set up a homemade Coraline box swap. 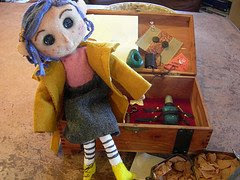 Several of the finished boxes have been posted, and they're just bursting with great stuff including homemade Coraline dolls. 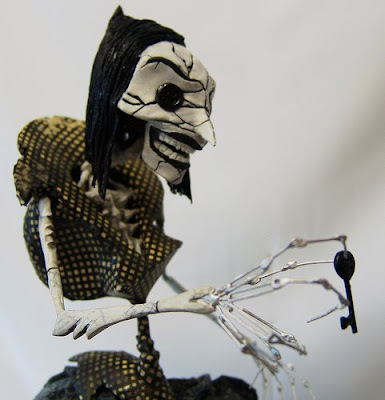 The Coraline box you see above is by Nani Kora. Clever Intellectual Property Donor sticker. 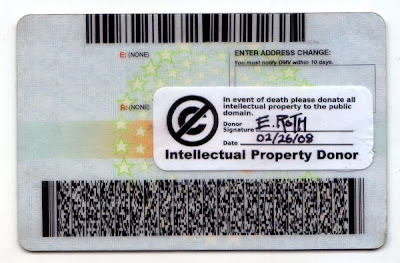 Download one here and place it on your driver's license to donate your intellectual property at death. 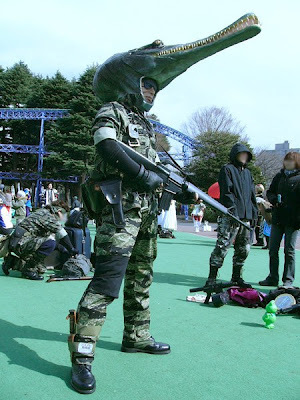 Solid Snake with his crocodile cap camouflage cosplay. More photos here. 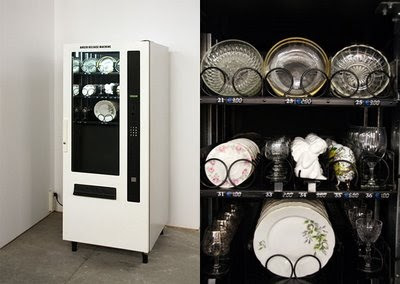 It's a vending machine full of china. 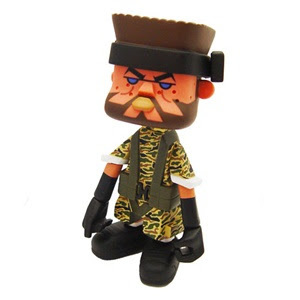 Buy an item and watch it drop and shatter. The Yarisal and Kublitz website is full of playful furniture, including a collapsing table and chairs built on a hidden seesaw. Go here to watch those projects in action. "a team at Google couldn’t decide between two blues, so they’re testing 41 shades between each blue to see which one performs better"
"Today is my last day at Google." 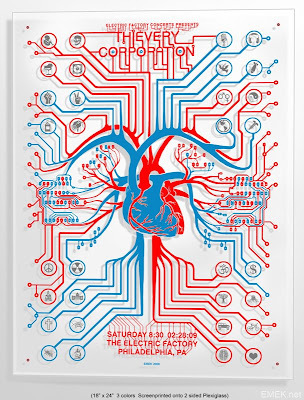 Thievery Corporation concert poster by EMEK. 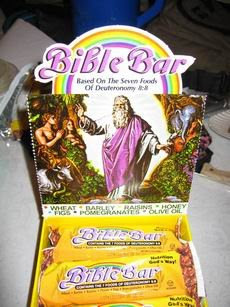 You can see it animated here, to get a better sense of the fact that it's printed on plexiglass. "Did you know the Clippers pay L.A.'s 710 AM to carry their live radio broadcasts?" 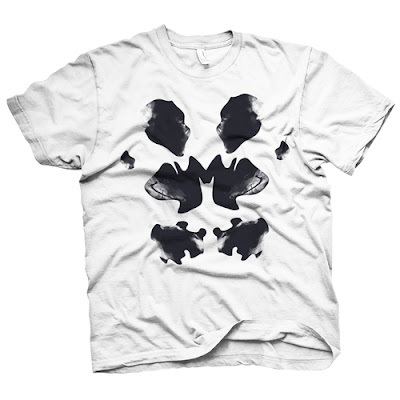 "Clippers fact of the day"
Rorschach t-shirt on sale here. 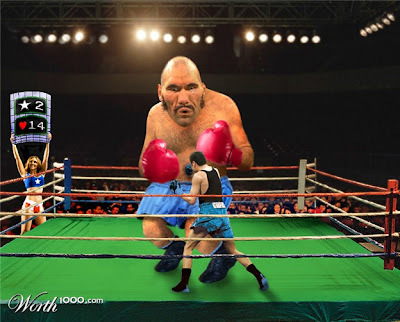 It's Bald Bull versus Little Mac in this video game-themed photoshop contest at Worth 1000. 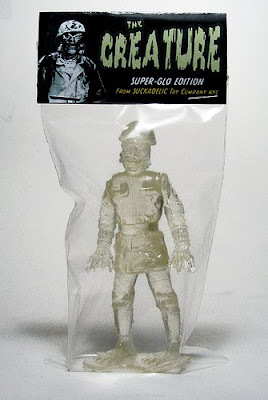 "Iron Chef Cat Cora And Wife Both Pregnant"
Based on Scott Campbell's designs, Russ Walko created mummy, caveman, and knight puppets. More photos here. 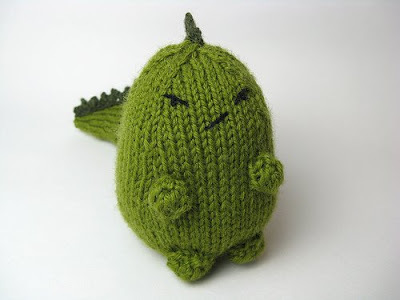 Go here for instructions on knitting a Grumpasaurus. 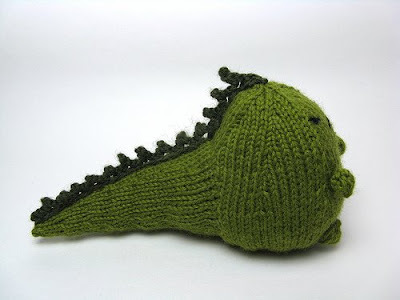 Also available, patterns for knitting donuts and peeps. 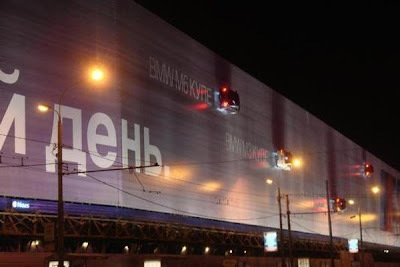 There's an enormous billboard in Moscow with five BMWs attached to it. At night, the cars' head and taillights are turned on. 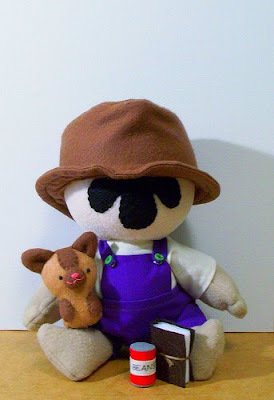 Plush Dr. Manhattan and Rorschach by Jennifer. 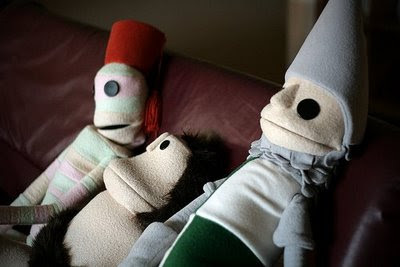 She's also created a plush zombie and The Question. Here's her Etsy shop. 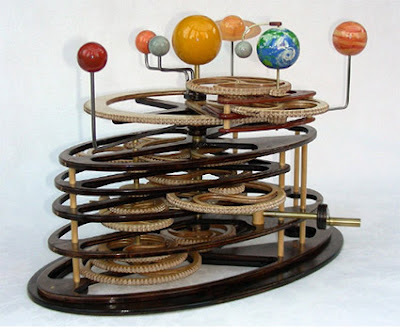 Wooden orrery by Dave Goodchild. It's Octopus vs. Shrimp in a Japanese game show. 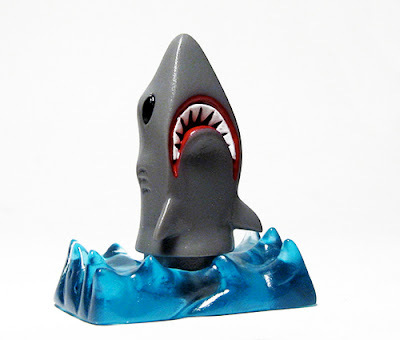 This was actually the boss fight for the shrimp. 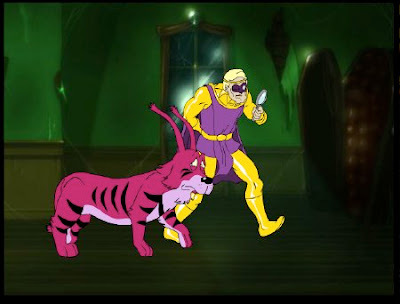 He'd already defeated a lobster and two crabs. One of several angry farewell cakes on display here. 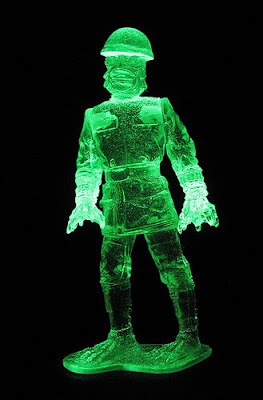 "Rutgers lost $184K on trip to PapaJohn.com Bowl"
"Time traveller dies tragically. 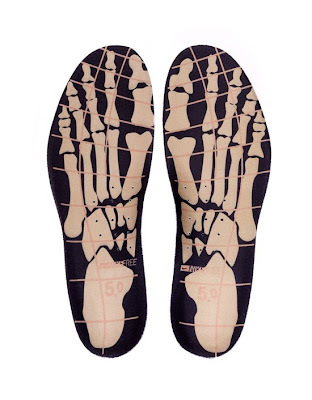 (1967 - 1608)"